Pure Tamilan, Can you please turn on the speakers, while you are using the site. 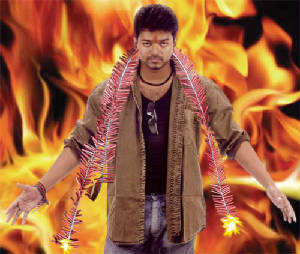 Vijay next film after Sachin will be Sivakasi. After having titles of Tamilnadu towns like Madurai and Tirupachi it is now the name of that town that is famous for crackers. Sivakasi will be directed by Perarasu who did Tirupachi and he will be the first director that the star will be repeating after many years! He has only repeated his father S.A.Chandrasekhar, Fazil and Vikraman in the past. This film will be produced by A.M.Ratnam for Sri Surya Movies. Says Perarasu: “I am thrilled that Vijay sir has reposed his faith on me”. 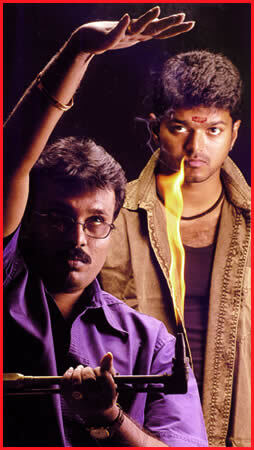 Sivakasi promises to be a film for Vijay fans with all commercial elements. 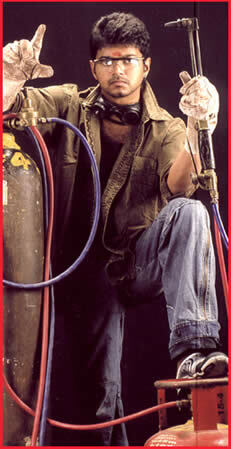 It will be released for Diwali 2005 and the rest of the star cast and technicians are yet to be decided. Vijay catching up with Rajini? Who is the Super Star? If you ask this question, theatre owners would tell you the correct answer, because they are the one who knows the pulse of the fans by the collection they get. This is the best way of ascertaining the positions of Kollywood Gods. By this yardstick, Vijay is coming next only to Rajini. Rajinikanth tops the list, whose film would be sold out just on the day of the pooja itself. The distributors had competed with each other to buy the film 'Chandramuki'. Now Vijay is creating record next only to Rajini in terms of area wise trade of his film. "The film 'Sachin' is a highly satisfactory movie for me. 'Sachin' had save me from the loss I suffered due to the debacle of the film 'Aalavandhan', says the Producer S.Thanu. Vijay's new film is 'Sivakasi'. The rights for this film has been sold out on the day of Pooja itself. The rights of Ramanathapuram and Madurai, areas alone were sold for more than two crores and Ten lakhs of rupees. It is a record as far as the Vijay's films are concerned. 'Chandramuki' was sold out for 2 crores and50 lakhs for the same areas. Sivakasi has got the second place. They say, very soon Vijay would catch up with Rajini. there is no doubt..Vijay is the next super star!!! The wounds inflicted by the Tsunami waves are yet to heal completely. Yesterday fishermen, who were affected by Tsunami, were given aid on behalf of Vijay. Pondicherry is one among the places affected by the killer waves. The president of Vijay's fans club of this region, Anand had made a request to Vijay to render help to the affected fishermen. Accordingly, new boats were given to 10 fishermen. The motors for these boats were given yesterday. Since Vijay is busy in the works related to the film 'Sivakasi', his father S.A.Chandrasekar had given away these motors to the fishermen. Vijay's fans welcomed him when he went to Pondicherry yesterday. After this reception, he went to the shore and met the fishermen. He gave away motors directly to the beneficiaries. Then he met the people affected by Tsunami and solaced them. S.A.Chandrasekar had said that, 'This kind of help would continue'. The people had thanked him and Vijay for the help they are rendering, on behalf of the affected people. On the whole, S.A.Chandrasekar's Pondicherry visit had turned out to be a touching affair. Welcome to Tamilmp3world.com - The new Art of Entertainment!